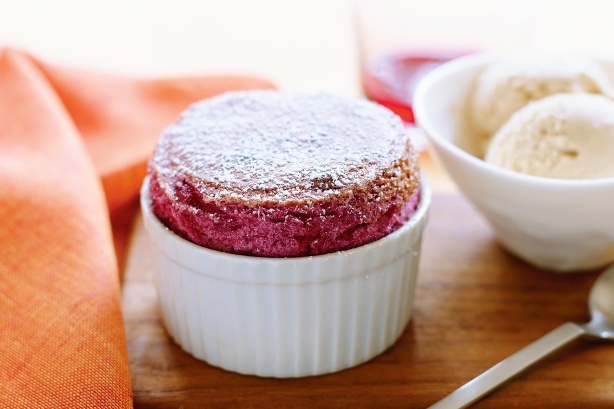 Gordon Ramsay’s Home-Made Raspberry Soufflé is often a delicious meal created from raspberries, eggs and Amaretto biscuits. 2. For the jam, mix together 1 c. raspberries, ¾ c. sugar and vanilla within a saucepan at medium heat until it reaches a thick consistency. Sift lots of people in order to remove seeds and set jam from the fridge so that you can cool down. 4. Take leftover raspberries and pour brandy over them. Set aside. 5. Crumble the amaretto biscuits. Set aside. 6. In a bowl, mix together 3 egg yolks, 1/4 c. sugar, and flour. Whisk. 7. Pour the cream mixture that had been brought to your boil to the same bowl and whisk again. 8. Pour the full mixture back to a saucepan and cook until it thickens. Once it thickens, pour it into another bowl and into the fridge to cool down. 9. Brush the insides of ramekins with butter, put from the grated chocolate and swish the ramekins around so it sticks towards the sides. 11. Put egg whites and ½ c. sugar into another bowl and mix until many experts have completely whipped. Stir within the whipped mixture in to the jam/pastry mixture. Set aside.